Now that Dark Nights: Metal is in the books, I think I can say with confidence that series scribe Scott Snyder is capable of penning a crossover story that’s as high concept and flat-out bonkers as anything written by Grant Morrison or Kurt Busiek. And while said finale contained a variety of occurrences that’ll no doubt reshape the DC Universe – and multiverse – as we know them, there was one little incident that we couldn’t help but discuss. By now, you’re probably well acquainted with the Dark Knights, a cadre of nightmare Batmen hailing from various Earths found in the Dark Multiverse. 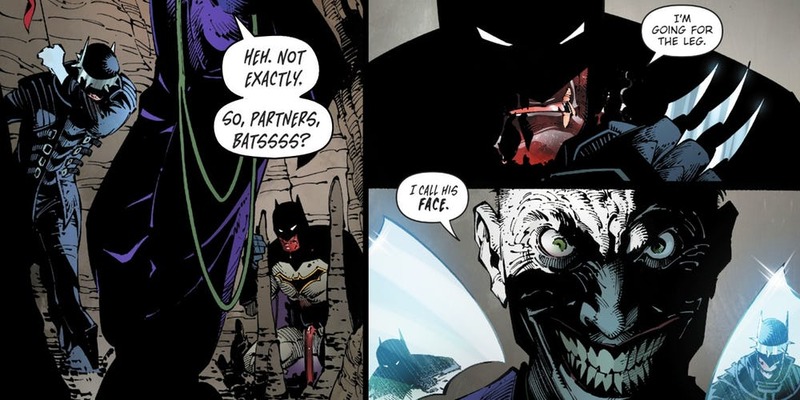 Naturally, you all have your favorites, but it could be argued that the one who got the most attention was that of the horrific Batman Who Laughs. Long story short, this version of Batman killed the Joker on his home world – only this iteration of the Clown Prince of Crime had a contingency in place. Upon his death, he infected “his” Caped Crusader, thus unleashing a bizarre hybrid of the two. In other words, you had all of the intellect and physical prowess of Batman joined with the madness of the Joker; a formidable package, to be sure. Knowing this, the demon Barbatos let the Batman Who Laughs often take the lead in their bloody crusade, creating months of misery for the Justice League and those residing on Earth-0. Fortunately, though, two unlikely allies bested him by doing something he never saw coming. 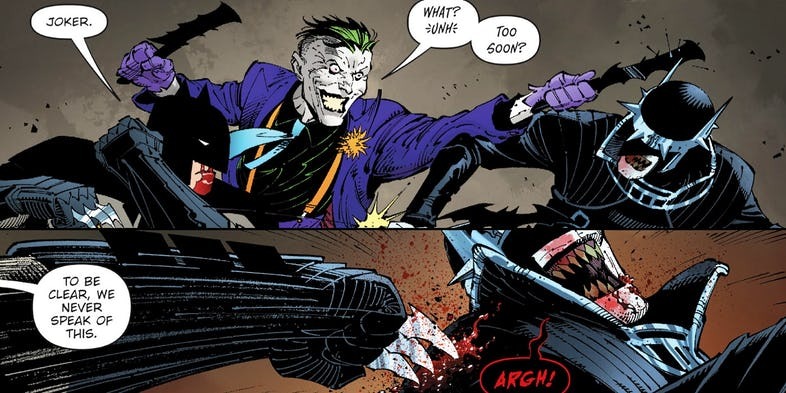 Utilizing the classic “enemy of my enemy is my friend” trope, Snyder’s epic saw “our” Batman and Joker fighting side by side, something the Batman Who Laughs never banked on. To their credit, this abominable team-up that they’ll never speak of again worked, thus making for one of the more memorable alliances we’ll see in comics this year. I guess the notion of saving all reality makes for strange bedfellows. Actually, this wasn’t the first time an extreme situation saw these two unite, but the fans are sure to talk whenever the unspeakable happens. That said, this may be motivation enough for some of you to pick up Dark Nights: Metal #6, which is now available in comic shops.